exeter – The buzzing of the lunch bell sends most students into a tizzy. It is an opportunity to fuel up on nutritious food, talk loudly with friends and maybe dribble a basketball. 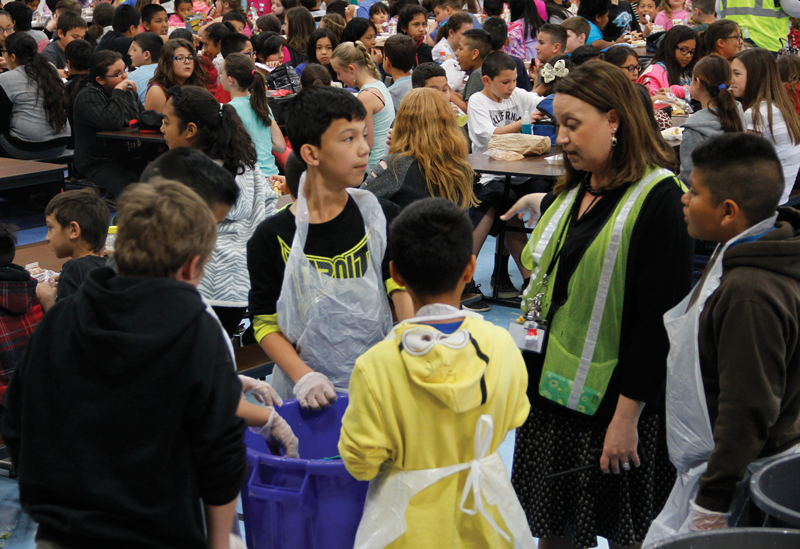 Instead of enjoying their well deserved break from academics, students at Lincoln Elementary School are eager to put on plastic aprons and gloves and sort through trash. For their efforts in reducing waste, Lincoln was named Exeter’s 2015 Recycler of the Year. Schools across California are implementing recycling programs on site due to the recent passing of Assembly Bill 32. Beginning on April 1 a commercial or public entity, such as a school or hospital, that generates a specific amount of organic waste, is required to divert its organic solid waste, reducing the amount of organic materials sent to landfills and increasing the production of compost and mulch. Additionally, schools that generate eight cubic yards of organic waste per week must arrange for organic waste recycling services. Lincoln Elementary in collaboration with Mid Valley Disposal’s recycling coordinator Sol Nunez are working to decrease their footprint on the earth by recycling their organic waste on site. “We asked ourselves, what is this going to look like on our site. With over 600 students on campus, feeding kids is already a challenge,” said Lincoln Principal Veronica Raigoza. Thankfully, Nunez was able to provide the site with great ideas on how to recycle lunchtime waste. The program officially rolled out in January and according to Raigoza has been extremely successful. Students in the recycling club help sort their fellow classmates’ lunchtime waste into disposable and compostable bins. Raigoza shared that it took two and a half weeks to properly train the students, “Every day they come ready and want to do it on their own.” Although students are still supervised by adult staff, the ultimate goal is for the recycling club to be completely student-run. She also plans to recycle paper school wide and hopes that the students will begin recycling during breakfast, “I want a completely green school,” shared Raigoza.